World Idli Day 2019: 5 Health Benefits of Everyone's Favourite Breakfast Dish, The Idli! There's no better (and nutritious) way to begin the day than with a steaming plate of idli. The breakfast dish made of the fermented batter of lentils and rice was invented centuries ago. Idli has not only stood the test of time but also emerged as one of the healthiest, most versatile snacks today. A survey on breakfast habits revealed that Chennai the best breakfast nutrient profile in the country. It's no coincidence that idli and dosas are the most widely-consumed breakfast staples in the city. Idli is a low-calorie food with little or no saturated fat and cholesterol. It has proteins from lentils, carbohydrates from rice and micronutrients such as potassium, magnesium, calcium, folate and vitamin A. 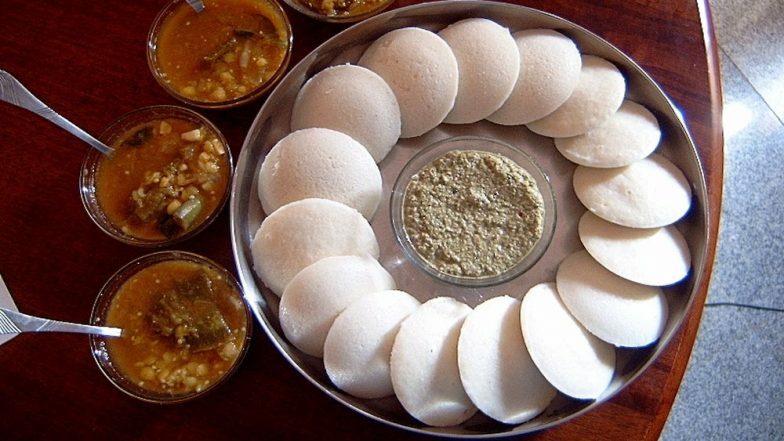 On World Idli Day 2019, we give you seven reasons why these South Indian snacks are the healthiest. Our unhealthy dependence on processed foods and poor lifestyle choices have wreaked havoc on our digestive health. Since idli is a fermented food, it eases some of the burden on the stomach during digestion. The presence of lactic in idli also helps gut health, since the acid restores the pH balance in the intestines. Urad dal or split black gram used in idlis is a high-fibre food, which contains both soluble and insoluble fibres. Idli serves as a great snack for those who have less-than-satisfactory bowel movements and digestive issues. The dietary fibre in the dish helps in the fast movement of stools, and rids you of bloating, constipation and cramps. Ahead of World Idli Day on March 30, Study Reveals Indians Love to Have Idli As Breakfast. Idli is a low-sodium food with no cholesterol. Naturally, it's good for the cardiovascular system. Idlis also contain a healthy amount of magnesium and potassium, which are great for the heart. These minerals improve blood circulation and maintain the health of blood vessels. You need carbohydrates for energy. Since idlis are made of rice, a great source of complex carbs, they are a great breakfast option for people who are on the go! A single idli can provide you with eight grams of carbohydrates. Plus, urad dal in the idli is rich in iron, which helps make red blood cells. These cells then transport oxygen to the rest of the body, providing the body with energy. March 30 is celebrated as World Idli Day to hail this beloved snack. With as little a pat of butter or chutney, you can relish these fluffy rice cakes at any time of the day. So grab yourself a steaming plate of idlis today!